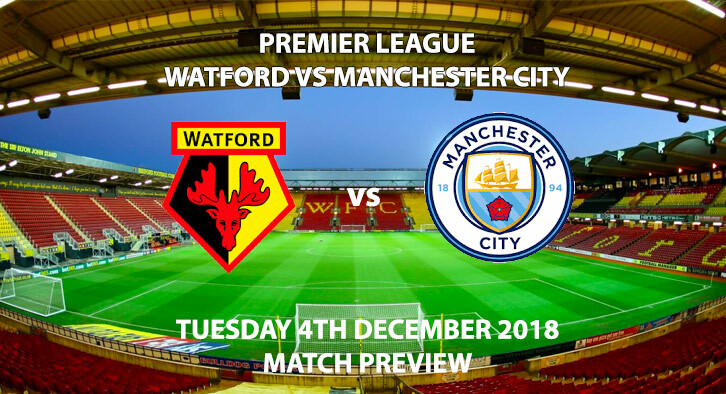 Watford vs Mancheser City: Manchester City will be hoping to extend their lead at the top of the Premier League when they visit Vicarage Road to face Watford. The champions of England still hold a two-point lead at the top of the Premier League, after their 3-1 win over Bournemouth at the weekend. Raheem Sterling again found himself on the scoresheet with his 11th goal of the season. Since the start of last season, the Englishman has found the net 34 times for club and country. That is a marked improvement on recent years, which shows how he has progressed recently. Sterling has consistently proven he is one of the Premier League’s best players under Pep Guardiola. He is a constant in the side, the next step for him is to replicate that form for England. If he can consistently lead his country then it would cement his spot as one of the best attackers in Europe. However, at the age of just 23, there is plenty of time for that to happen. With a tough game on the horizon against Chelsea at the weekend, City will want to turn in a good display in the capital. Watford have been in poor form recently, after a very strong start to the campaign. The Hornets have lost three of their last four games, winning none. Looking further back, they’re on a run of just two wins in their last ten Premier League outings. Despite that run, they still sit tenth in the table, 11 points clear of danger. Javi Garcia has an abundance of talent within his squad’s ranks, particularly in central midfield. Etienne Capoue, who will miss this fixture due to suspension, and Abdoulaye Doucoure are a French midfield pair that wouldn’t look out of place in a top-six side. Their dynamism is matched by Gerard Deulofeu and Will Hughes, who provide that attacking flair to unlock defences. There is no doubt that all of the Watford side will have to be at their best to get something out of this game. Paul Tierney is the referee for this game. The Englishman has officiated nine top-flight games this season. In that time, he has accumulated an average booking points total of 37.8. As a result, I would recommend a maximum of 50+ total points for this fixture. Watford have a lot of talent and proved they have the potential to upset the big boys. However, City are yet to take their eye off the ball and a weekend trip to Stamford Bridge should only sharpen their focus. Therefore, I’m going to side with Guardiola’s men. Watford vs Manchester City will be televised live in the UK on BT Sport 1 with kick-off at 20:00 GMT. Correct score: Manchester City win – 3-1 – (link no longer available). Scorecast Boost – Gabriel Jesus to score first and Manchester City to win 3-1 – 50/1. Player to score outside the penalty area – Leroy Sane – 28/1. Popular RequestABet – David Silva to score, Manchester City Win and BTTS – 11/2. RequestABet – 80/1 and above – Watford to win, BTTS, 8+ Manchester City corners and 20+ booking points each team – 100/1. Odds and markets last updated on Tuesday 4th December @19:15 GMT. Keep checking back to see if there’s any updates to markets – the time stamp in the previous sentence for when we update tips on this page will be updated.